Rendering courtesy of the city of Laguna Beach. 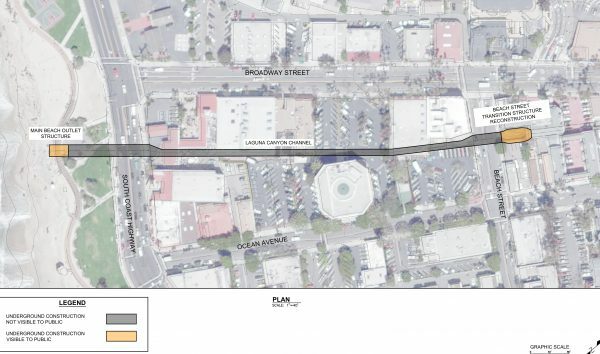 This project will rehabilitate the deteriorated Laguna Canyon Channel between Beach Street and Main Beach to improve storm water flow in Spring 2020. Construction duration is anticipated to be four months, with much of the work taking place in the underground channel with no visible disturbance to the general public. The two publicly visible components would include the reconstruction of the Beach Street transition structure and the Main Beach outlet structure, where the work may pose an intermittent pedestrian and/or vehicular impact. Work is expected to take approximately five weeks at each location. The workshop will be held in the City Hall Council Chambers, located at 505 Forest Avenue. Those who are unable to attend the meeting and would like to provide comments can contact Mark Trestik at [email protected] or call 949-497-0300.